The pattern of stars in the night sky usually looks the same from night to night and from year to year. But every century or so, a new star appears suddenly one night and then fades back to invisibility over the next few months. Such a star is called a "nova" (from Latin for "new"). As astronomers learned about the true nature of stars, they realized that novae were exploding stars. Some novae were fairly bright--reaching a few hundred thousand times the brightness of the Sun. Other novae were incredibly bright--reaching several billion times the brightness of the Sun! These amazingly bright novae were renamed "super"-novae. The drawing at the top of the page shows the transfer of matter from one star to another in a binary system. The "normal" star (lower left corner of the drawing) has expanded until the gravitational pull on its surface by the small, bright partner--a white dwarf--is equal to its own gravity. 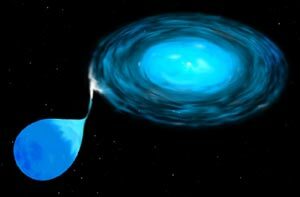 This allows gas to "leak" away from the normal star onto a disk of material around the white dwarf. The material in the disk spirals inward and collects on the surface of the dwarf until it collapses to form a Type I supernova. Illustration courtesy of STScI. There are two main types of supernova. The first, called Type I, occurs when a burnt-out star called a white dwarf orbits around a large star. Gas from the large star collects onto the white dwarf, increasing its mass and surface gravity. If the gravity on the white dwarf becomes strong enough, the dwarf becomes unstable and collapses, releasing huge amounts of energy. Part of the mass of the collapsing dwarf is blasted outward as a supernova explosion cloud while the rest falls inward to form a "black hole." The second type of supernova, called Type II, occurs when a star greater than about 8 times the mass of our Sun runs out of nuclear "fuel." The star's core collapses in a fraction of a second and releases huge amounts of energy and sub-atomic particles. Part of the core and the outer layers of the star are blasted outward in an explosion cloud, and the rest of the core collapses inward to form a black hole or a neutron star. This image of Betelgeuse taken by the Hubble Space Telescope is the first image of the disk of a star other than our Sun. 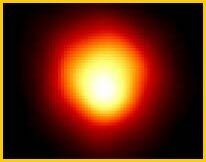 Betelgeuse is a red supergiant star over 1,000 times larger than the Sun and 10 to 20 times as massive. Someday in the not too distant future, Betelgeuse will explode as a Type II supernova. Photo courtesy of STScI. Dino Extinction by Supernova | Suddenly One Night | Look, Up In the Sky! | Did It Happen?